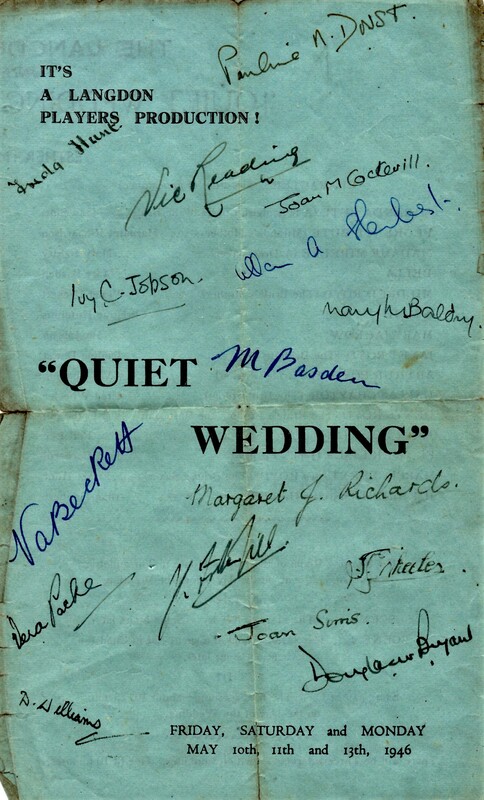 Printed on war economy paper this 1946 programme for Langdon Players production of Esther McCracken’s, comedy ‘’Quiet Wedding’’ is looking a little ‘’dog eared’’. It probably owes its survival to it having been signed by the cast. 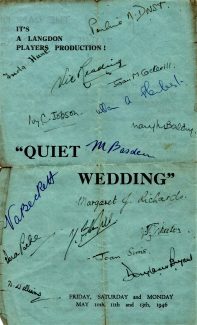 Even then it may not have come down to us had not been signed by the youngest member of the cast, the station master’s daughter of Laindon Station, Joan Sims. She appeared as a schoolgirl, Miranda Bute, a cousin of the Bride in this comedy based on family differences. She was just 16, having celebrated her birthday the day before the opening of the show. This being Langdon Players first presentation since 1940, it was probably Joan Sims’s first show.